Experience an island getaway with a nourishing body cream to transport your senses. ...take an exotic journey deep into the heart of the Indian Ocean. 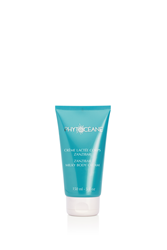 Phytocéane invites clients to take an exotic journey deep into the heart of the Indian Ocean, isolated from the rest of the world with ZANZIBAR MILKY CREAM. Inspired by the beauty of Zanzibar, a Tanzanian archipelago off the coast of East Africa, Phytocéane used key ingredients like Virgin Coconut Oil and moisturizing vegetal coral to create this gentle, velvety body cream to envelop the skin in moisture while promoting relaxation and well-being. This milky body cream is part of Phytocéane’s ZANZIBAR collection, which also features a shower gel with the same enticing island fragrance of vanilla and coconut with floral and citrus notes. ZANZIBAR MILKY BODY CREAM is a complement to Phytocéane’s professional ZANZIBAR DESTINATION body exfoliation and massage and can be purchased in select spas or online at http://www.lespausa.com. Directions for use: Apply daily to the whole body using ascending circular movements. When exploring the secrets of Phytocéane clients will discover a natural, marine brand that reveals precious JEWELS OF THE SEA and sets itself apart as a true treasure in the spa industry. Nestled in the heart of the Emerald Coast in France, Phytocéane embodies the region’s timeless tradition of travel, escape and discovery. This professional, naturally-based facial and body care line utilizes resources and ingredients found in the most pristine, beautiful seas around the world. We are one of the only spa brands with our own laboratory, allowing us to research and cultivate our own ingredients, develop unique cosmetic formulas, manufacture skin care products and create cutting-edge professional treatments to deliver remarkable results.